The "Barbecue Wife" was born out of the spirit of all the amazing people I have met through my own adventures as a Barbecue Wife. There is a secret to be revealed inside each bottle of Barbecue Wife Bloody Mary Mix. As you drink it down, pay close attention to the inside of your bottle, and you will meet a Barbecue Wife like you've never seen before. So what makes up a Barbecue Wife you ask? 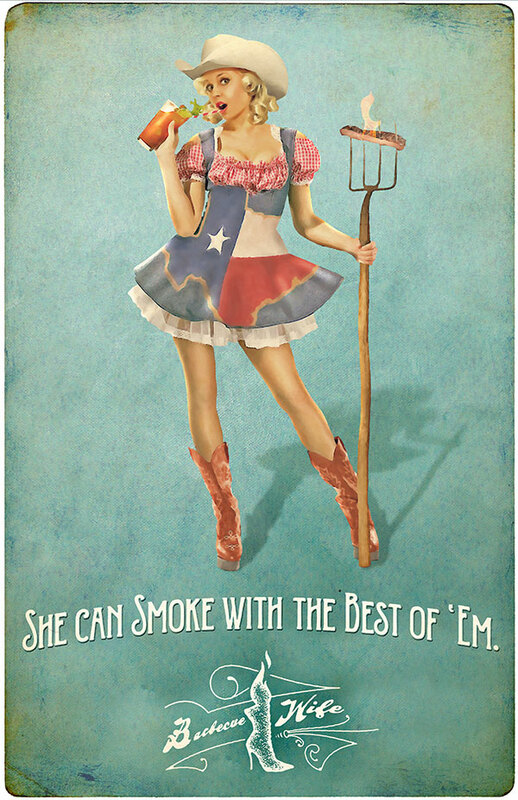 She's a Cheerleader for the "Sport of BBQ".... because in Texas it IS a sport. She can "smoke" with the best of em, and yes you will find her behind the pit as much as in front of the line. She know's how to throw a helluva party and make you feel as you have belonged there all along. Above all else, she knows what it means to work hard and create a life worth living. We hope you enjoy meeting and sharing our Barbecue Wives as much as we enjoyed sharing them with you.